"Kings" A Tribute to Garth Brooks and Elvis Presley has not played in Branson since 2011 and are currently touring the country. 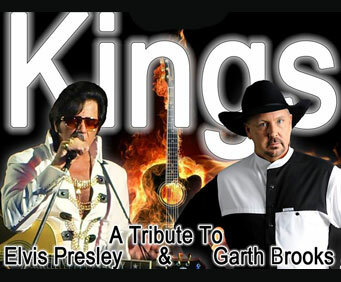 Audiences will hear concerts from one of country music's greats as well as the innovator of rock 'n' roll in 'Kings' A Tribute to Garth Brooks and Elvis Presley, accompanied by the live 'Kings' Band in a tribute show fans of all ages will enjoy. K.B. 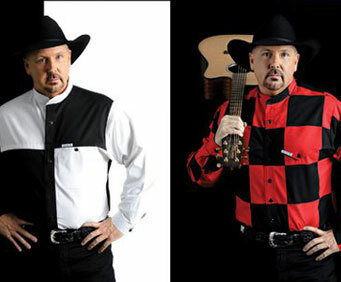 Jacks is ready to let the 'thunder roll' as he portrays the 'King' of country, the legendary country music star Garth Brooks and also taking the stage is performer Bill Chrastil who will become none other than the 'The King' of Rock n' Roll, the immortal Elvis Presley. K.B. Jacks not only look remarkably similar to the country superstar, but he sounds and performs the part as well. With hit songs like Friends in Low Places, Thunder Rolls, Ain't Goin Down Till The Sun Comes Up, The River, Rodeo, and more audiences are sure to be singing along to their favorite tunes from the highly acclaimed Garth Brooks. K.B. 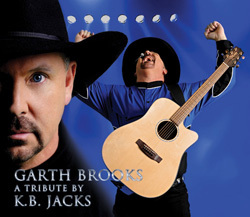 Jack's spot-on performance will leave guests thinking that they witnessed the real 'King', Garth Brooks in concert. Bill Chrastil is 'The King' and takes care of business with an incredible representation of a 1970's Elvis Presley. Bill does a remarkable job recreating memories with a Las Vegas type high energy show that will leave you speechless. His moves, his voice, his look, down to the sideburns, are so authentic that it's as if the legend has returned to reclaim the spotlight. Singing Kentucky Rain, Suspicious Minds, In The Ghetto, C&period;C. Rider, Blue Suede Shoes, and so many more, you'll be magically returned to a 70's Elvis concert stage. These two talents combined present a remarkable show that displays the legends of two different genres, and both are done with finesse and accuracy. You'll hear a variety of styles at this concert that will keep things entertaining and moving right along. This performance is a great one for the whole family, especially the fans of country and music legends in the group. This show was amazing!!! I thought k.B. (garth) gave an excellent performance and looks and sings so much like garth. He didn't have to do much to get the audience to participate because he is a natural and his interaction with the audience was amazing. He was all over the stage and floor and wanted the crowd to sing and dance to his songs, we knew every song! The live band was great and we loved watching them joke around with each other. Bill's (elvis) show was just as entertaining and he sounds and danced like elvis. Wow, he can move...It was great! The crowd was ecstatic over the songs he sang too. We really enjoyed our night and the tickets were very reasonable for us to go. We didn't’t want it to end because we were having so much fun. We would definitely return to watch this show again and we highly recommend this talented show! Have been to many branson shows over the years. Enjoyed almost all of them. This, sadly, was the absolute worst. While both headliners worked hard to give a good show, neither sounded like the star they were trying to impersonate. With the exception of the guitar player, the band gave the impression they had absolutely no interest in entertaining and gave absolutely no energy to the headliners or the crowd. Felt more like we were at a small, mediocre, practice-lacking high school production than a real branson show. Please, branson, don't compromise in the way you advertise, you'll lose your credibility. What a great show! Garth came out in the audience and made the show personable. He can really sing! So nice to see a live band and not recorded music. This is garth! What an incrediBle show! I loved every minute of it. K.B. Looks and sounds just like garth and he interacts with the audience. We loved how he has a real band and isn't singing to recorded music. This is a show we will see again and we will be telling all our friends to see it. This is a must see while in branson! !